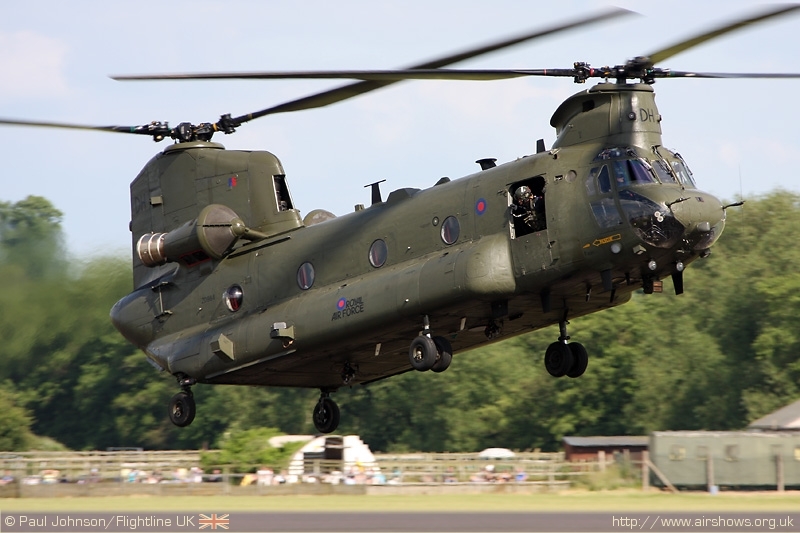 The RAF Cosford Airshow marks the first of the RAF's airshows of the year, and is one of the first major shows of the year. 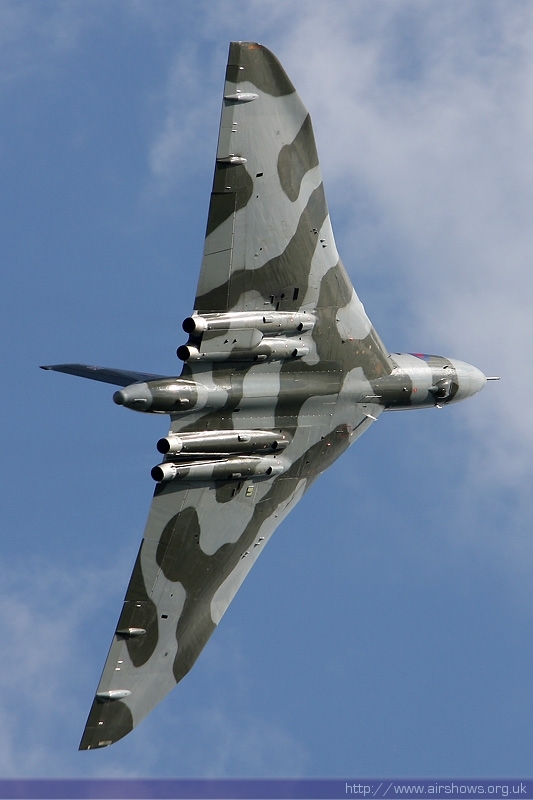 2009's show was special for a number of other reasons too, not least the first 2009 display by Avro Vulcan XH558. 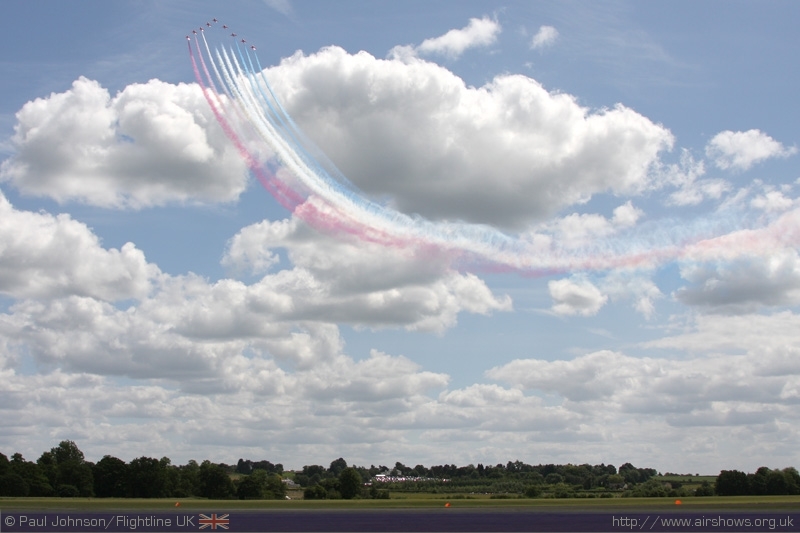 The Cosford airshow is the only major airshow in the West Midlands and regular attracts large crowds, but 2009 saw all records smashed with the gates shutting just after 1pm. 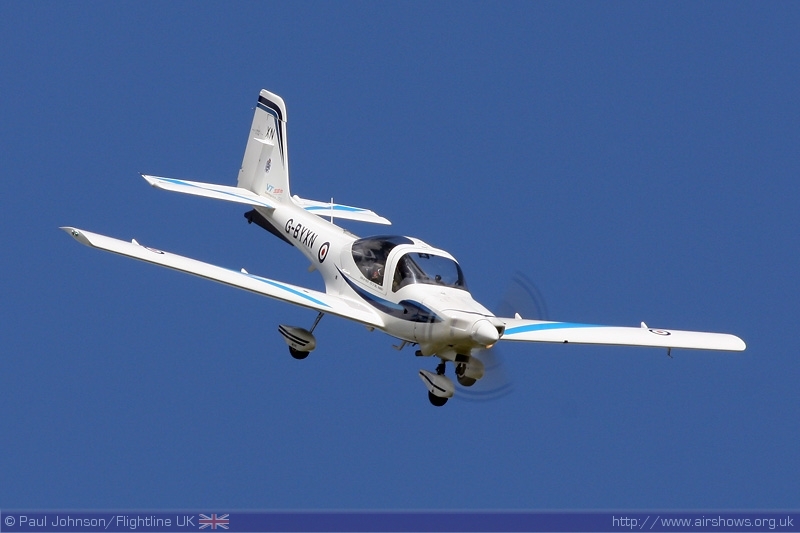 Paul Johnson/Flightline UK reports from a scorching day in the West Midlands. Photography copyright of the Author. The Vulcan finally made it's highly anticipated first display of 2009 following a difficult winter with the Vulcan to the Sky Trust facing up to the harsh financial climate. Several successful fund raising campaigns including a 24 hour scramble to visit all the UK's preserved Vulcans succeeded in raising the much needed funds as well as a huge amount of publicity. 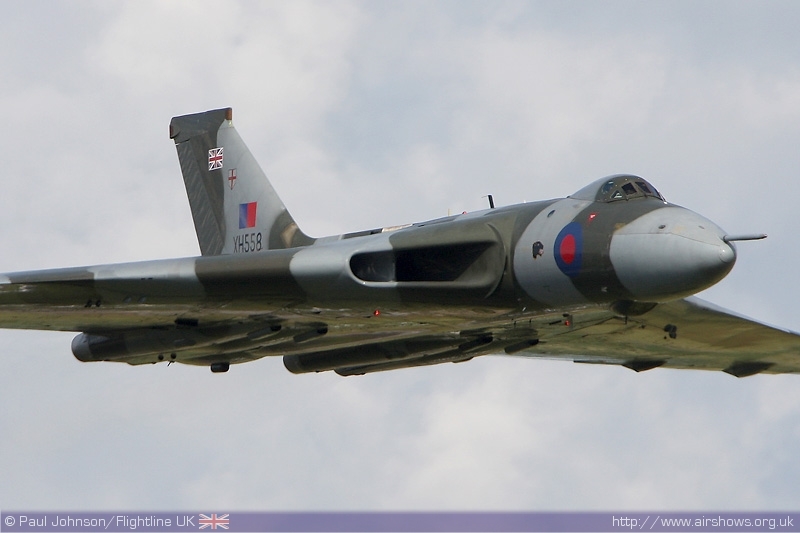 After Cosford, the Vulcan is heading to Volkel in the Netherlands and the Kemble Air Show. 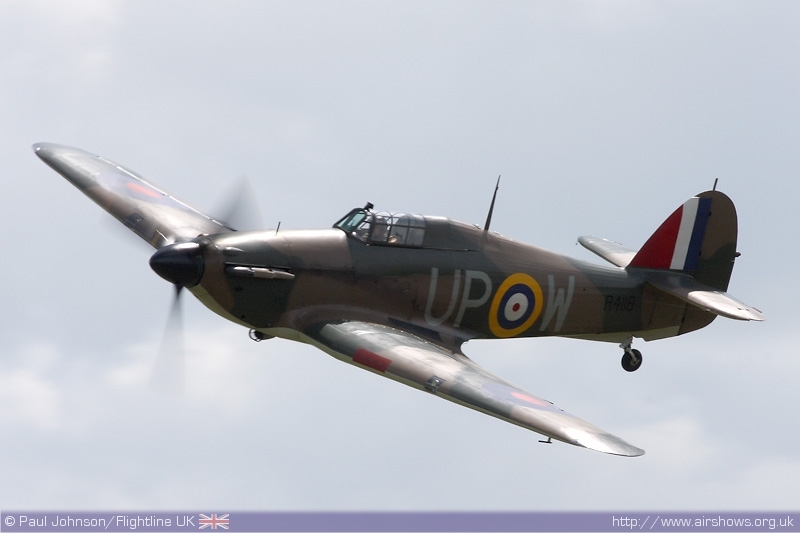 2009 is a difficult season for many major airshows with a significant change in RAF participation. 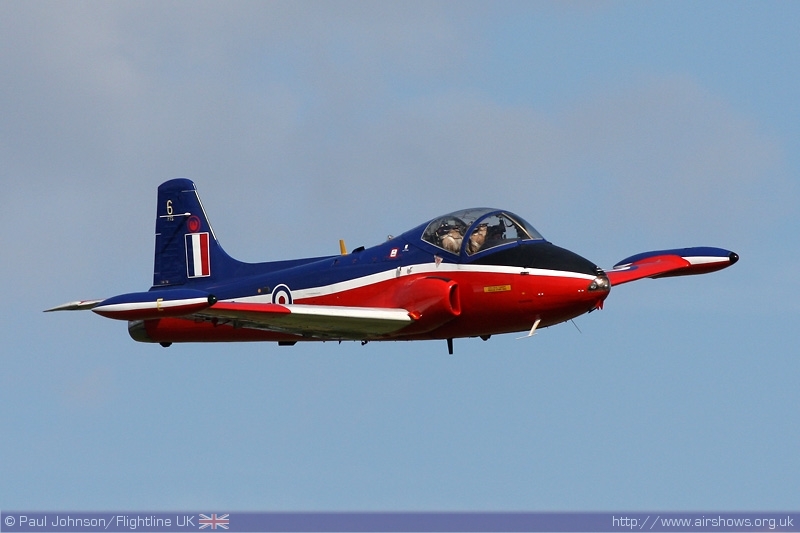 The RAF's role demo is confined to recent history for now and the loss of he Tucano display has put a huge dent in the number of display commitments that can be honoured. 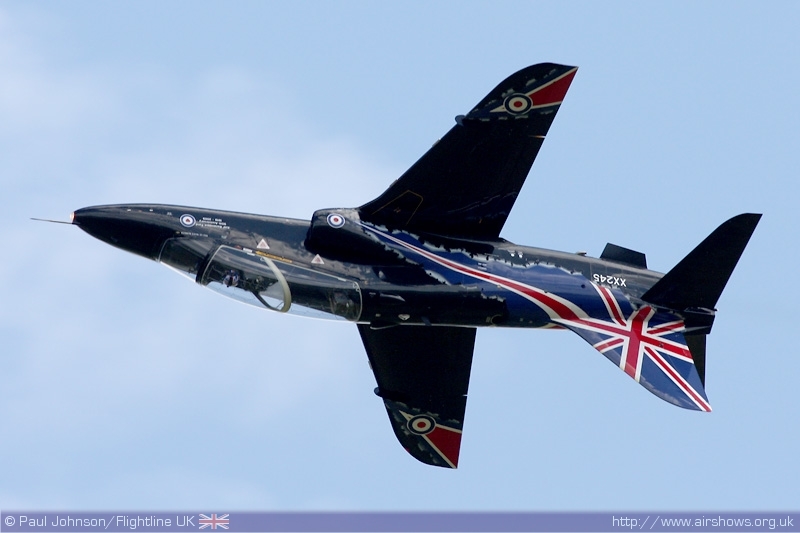 Nowhere else will highlight this as much as the RAF's own airshows which have seen the most dramatic changes. 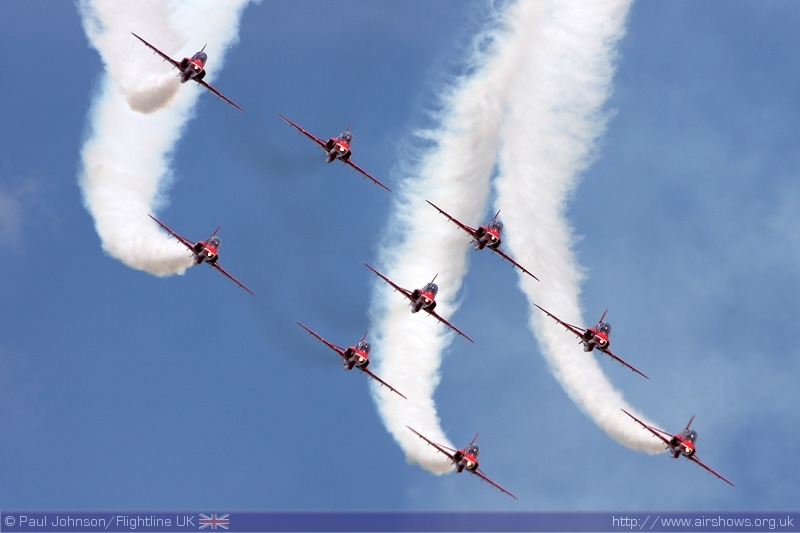 No longer can flying display directors rely on two to three hours of RAF solo and team displays to fill out a show. 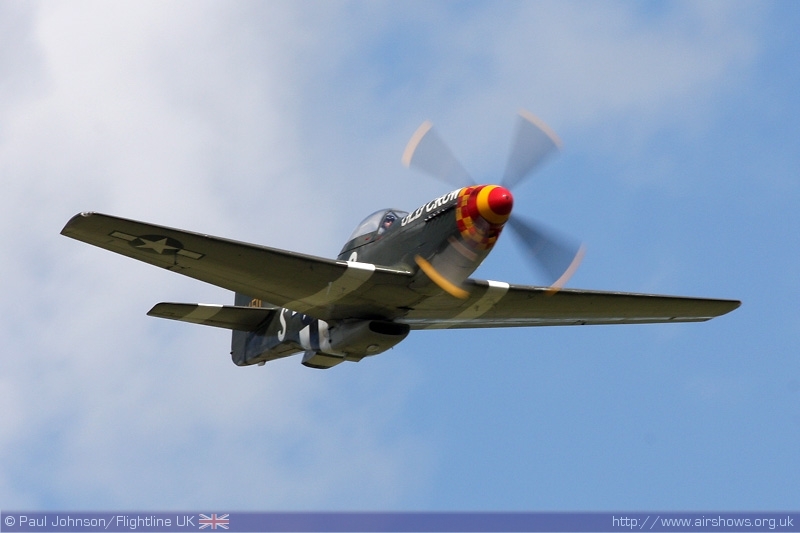 This year, more than ever they have to go through the entire spectrum of displays to create a full and varied display that will have something for everybody, not just the enthusiasts. 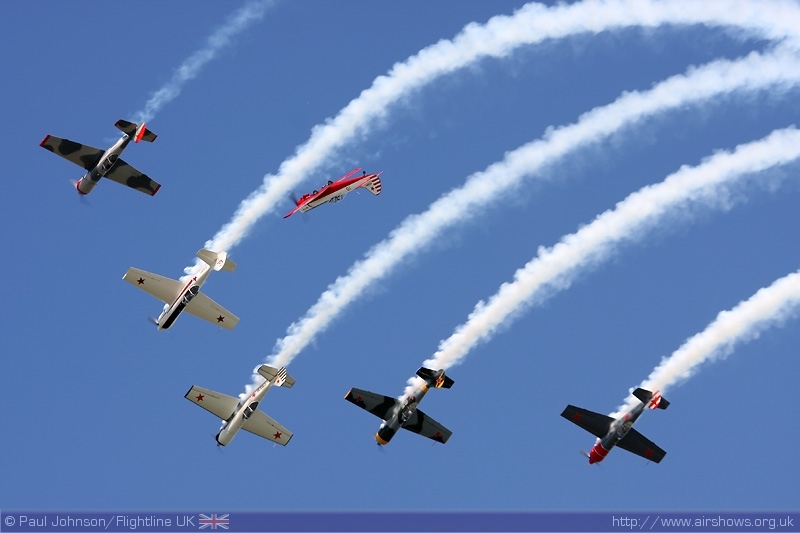 Generally the military displays are much cheaper than their civilian counterparts which puts a strain on the budget of any airshow in these difficult financial times; a balance between costs against income (tickets sales, sponsorship and corporate entertainment) can be tricky to achieve. 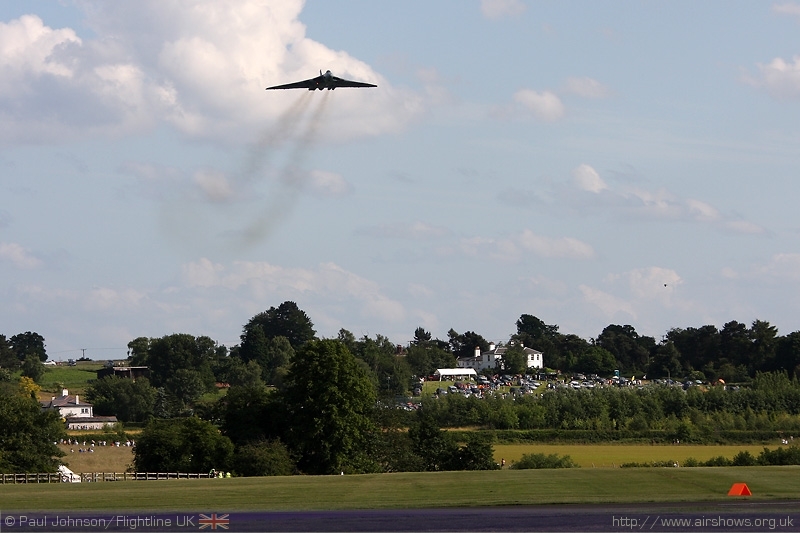 The scorching hot and weather, and in part the anticipation of a display by the Vulcan led to record crowds at Cosford. 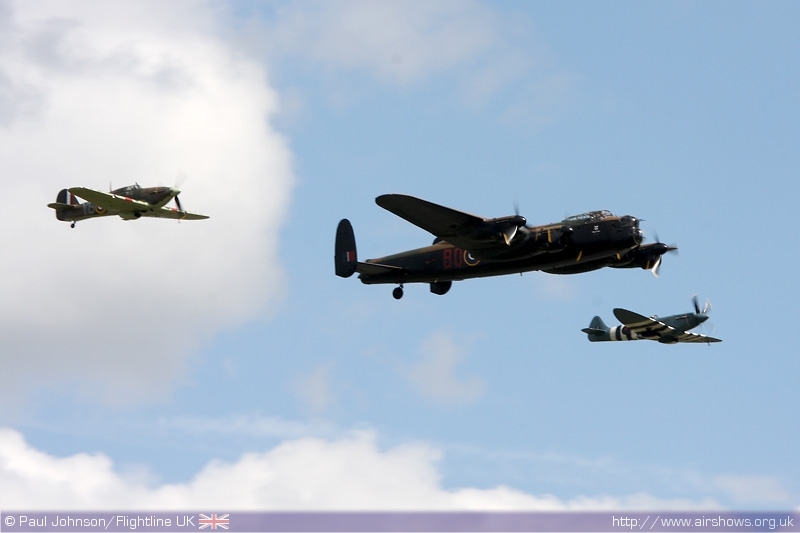 The estimated total that turned up to the airfield was 58,000. 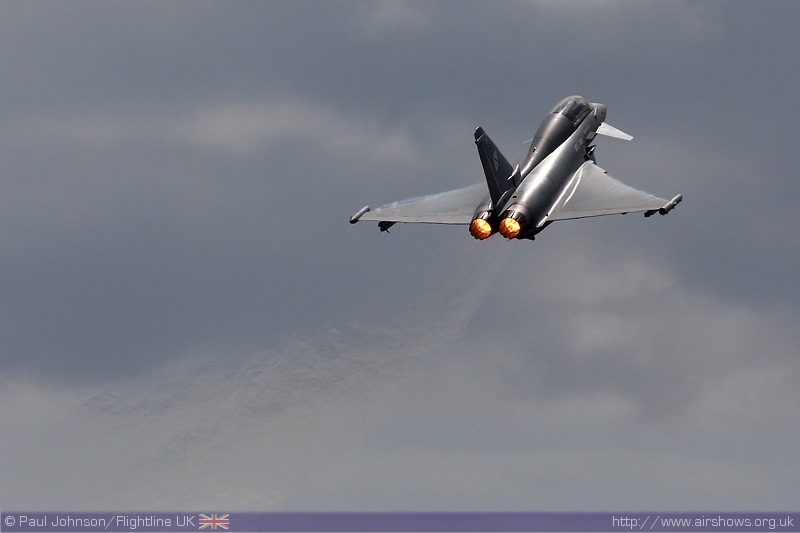 Many were turned away in early afternoon as Cosford was unable to soak up any more traffic. Outside the airfield every other viewing opportunity was used and car were even parked up on roundabouts and the verges near the M54! 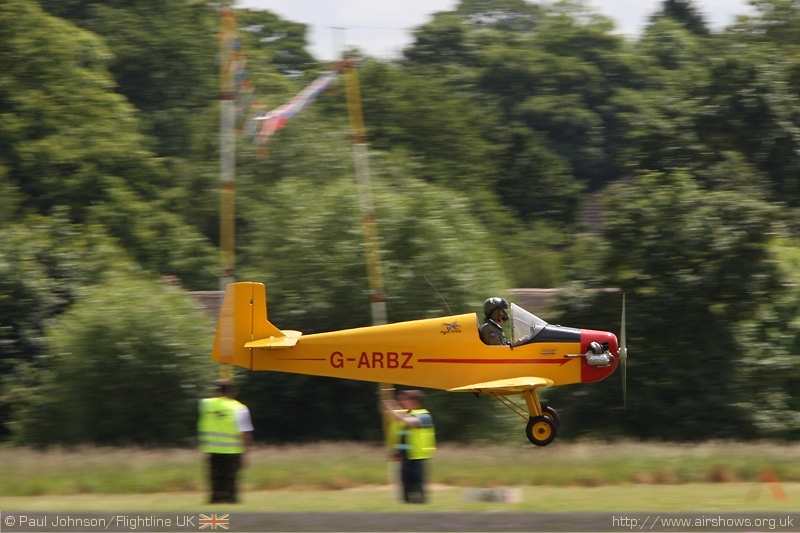 Inside the airfield, there were all the usual ground shows you come to expect at airshows including demonstrations from the the based college which includes Jaguars, Tornados and Jet Provosts. 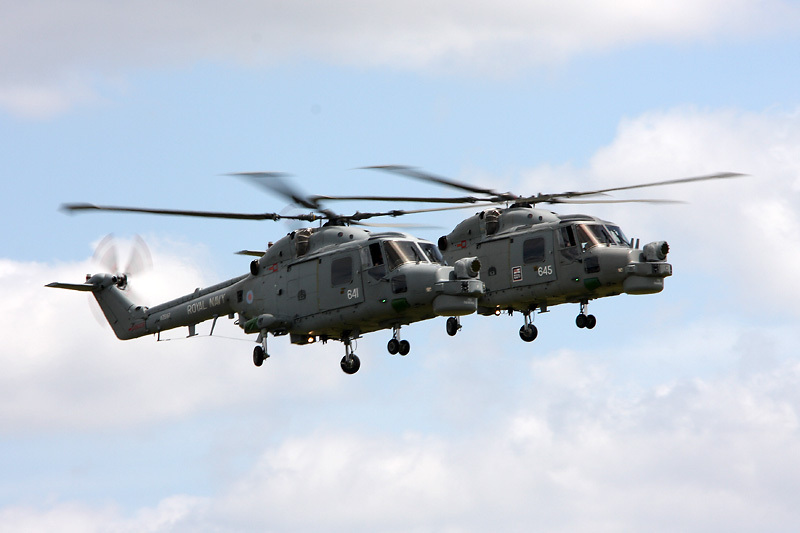 Visitors could also visit the co-located RAF Museum and the new Cold War exhibition. 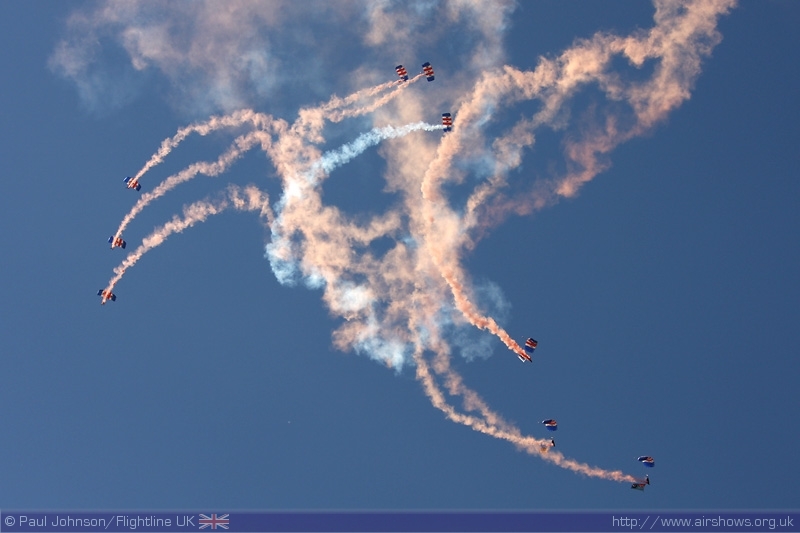 The show was opened by the RAF Falcons Parachute Display Team who jumped from a Chinook rather than the normal Hercules but the team were able to perform a full freefall display in the sunny blue skies. 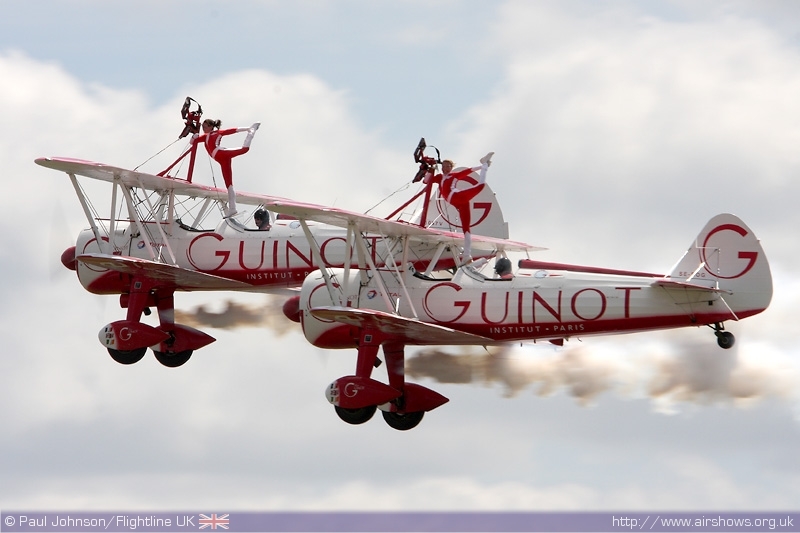 They were followed by Team Guinot and their two Boeing Stearman flown by Vic Norman and Steve Hicks. 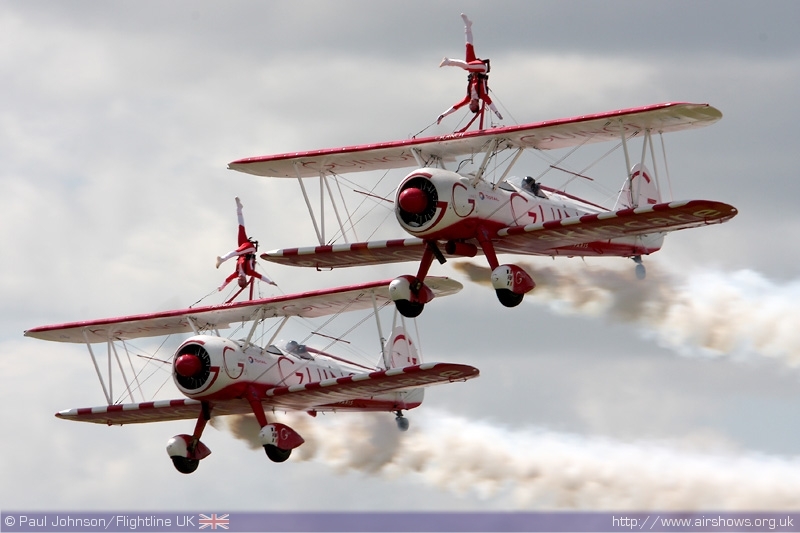 On the wing were Sarah Tanner and Lorraine Saddler. 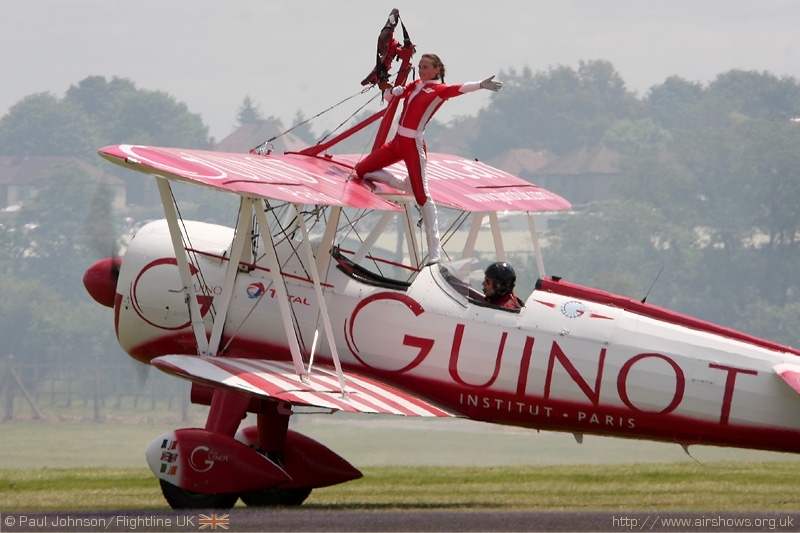 Team Guinot were just one of several civilian acts. 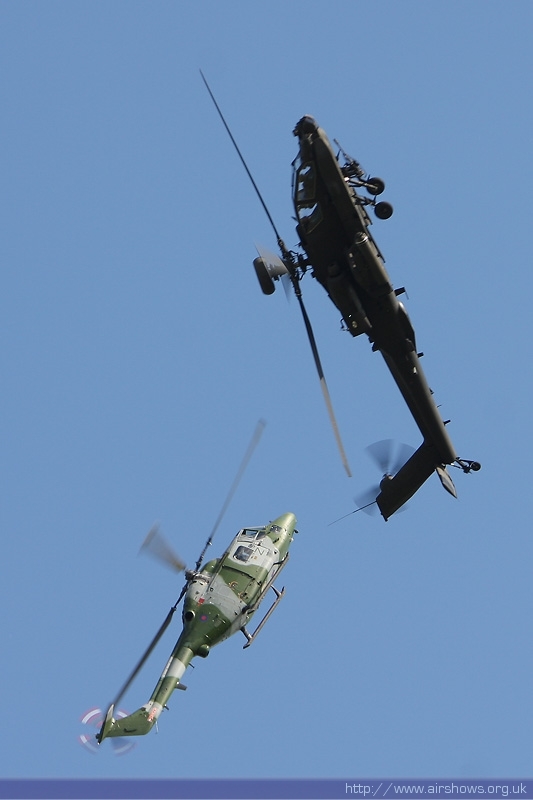 Continuing the "barnstorming" theme were the Tiger Club Turbulent Team with their usual aerial antics. 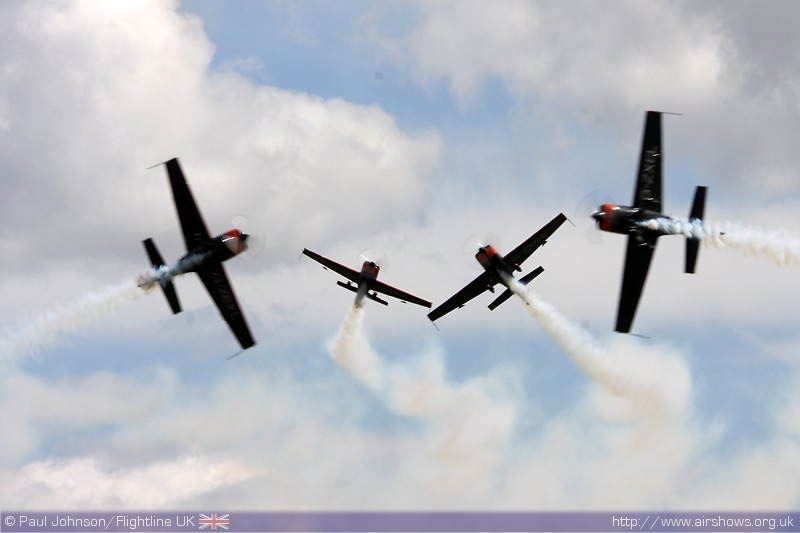 Some top level formation aerobatics was seen courtesy of the Blades under the new leadership of Myles Garland. Andy Offer has moved to take more of a role running the business behind the team, 2Excel Aviation. However, he will make guest apearances as Blade 3 during the season. 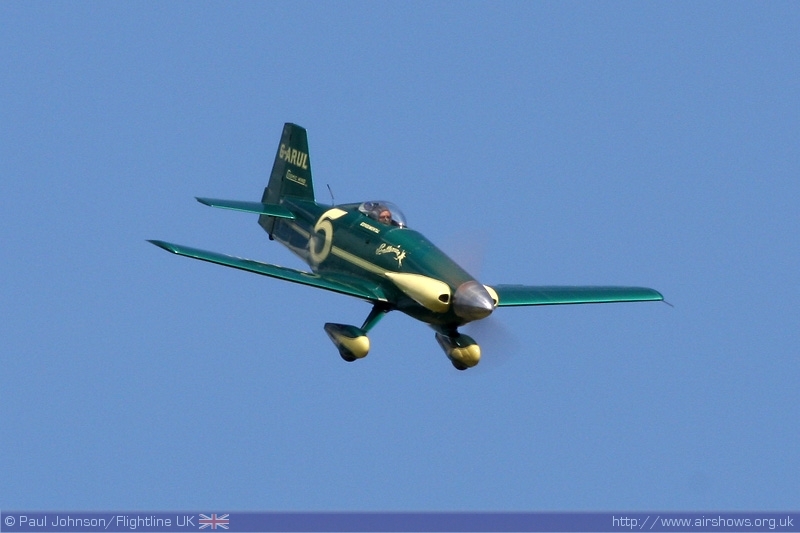 Pete Kynsey gave an awesome display of aerobatics in the Cosmic Wind, a small aeroplane design for Formula One air racing. 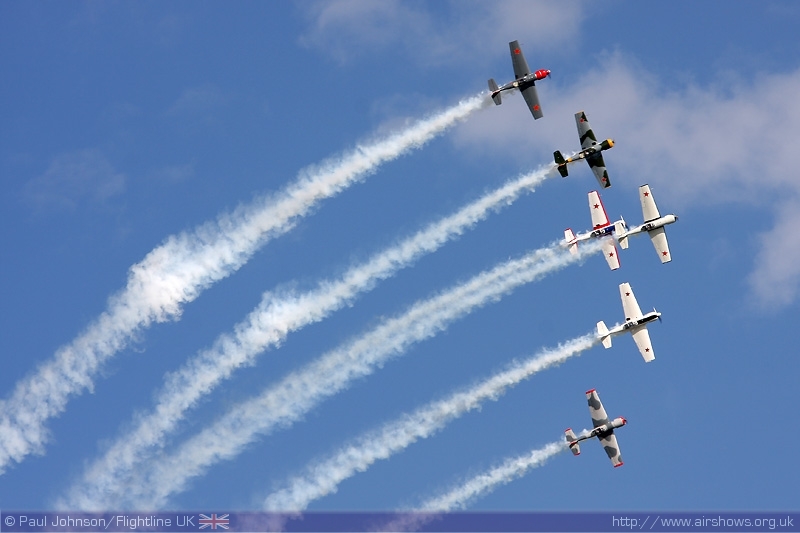 The honour of closing the show went to the Aerostars who put on a very good display of formation and solo aerobatics in their Yak-50s. 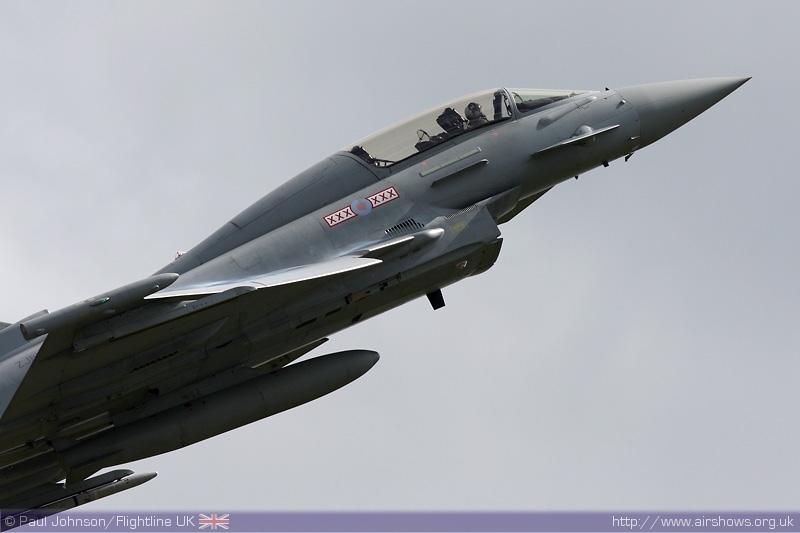 Commentary for Cosford was supplied by the Airsound team of Sean Maffett and Jonathon Ruffle. 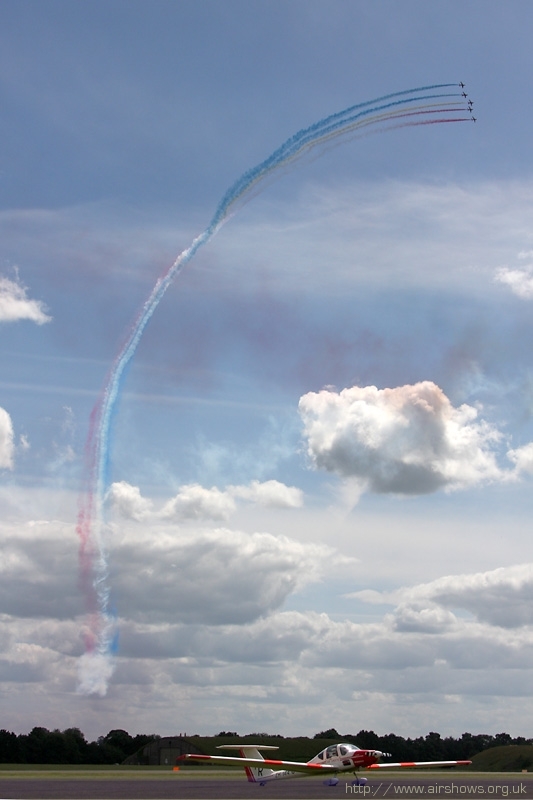 For the Cosford Airshow they produced a unique combination of audio broadcast and displays called "Into the Wild Blue Yonder!" 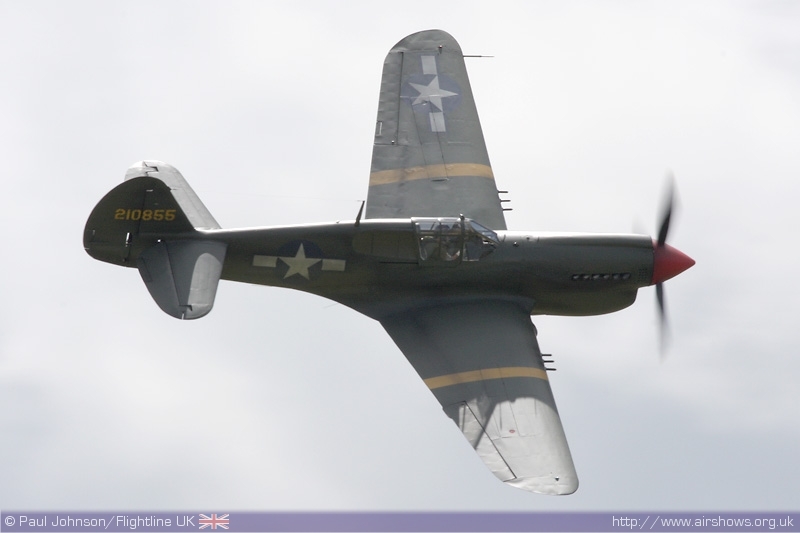 Using intervew with displays pilots Anna Walker (P-51D), Flt Lt Dave Deighton (Chinook) and Flt Lt Matt Marker (Hawk) as well as interviews from other aviation personalities and the public, the broadcast conveyed the romance and love of aviation that many people share. The broadcast was thought provoking and entertaining as well as highly orignal and will hopefully be repeated at further shows. Historic displays were plentiful too with a number of different machines. 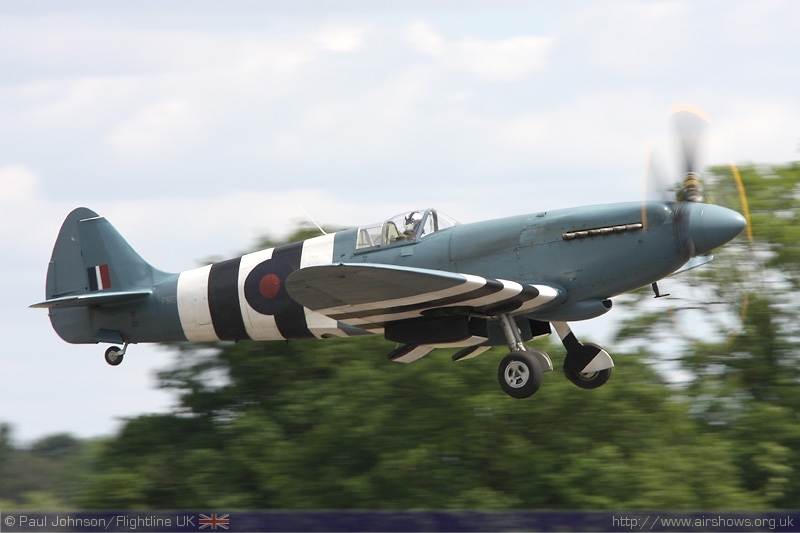 Peter Vachers's Hurricane I, Peter Teichman's P-40M Kittyhawk and Anthony Hodgeson's Spitfire IXT all put on spirited displays. 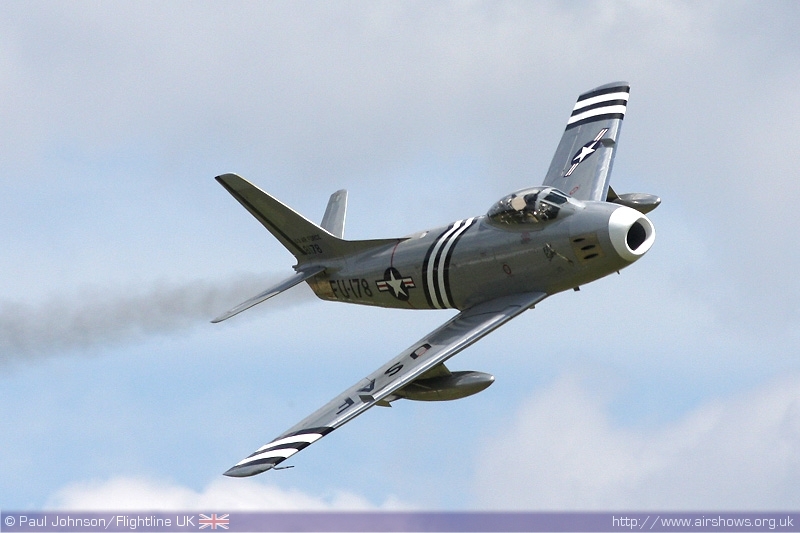 Later piston power was represent by Martin Willing's T-28S Fennec. 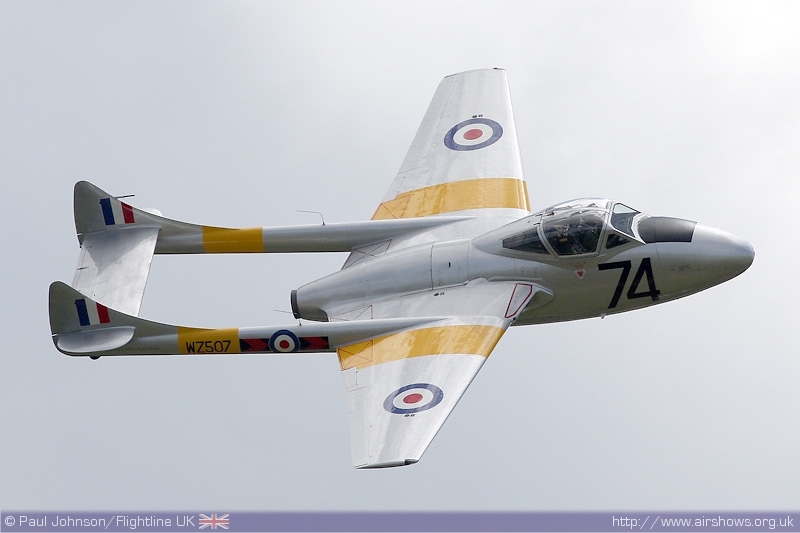 Classic jets also were out in force with displays by a pair of Jet Provost T5s, VPG's Vampire T11 and one of the final UK appearances by Golden Apple's F-86A Sabre before it heads across the atlantic. 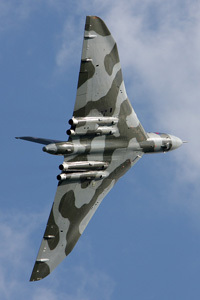 Of course, the most popular historic aircraft taking part was the Vulcan B2 XH558. 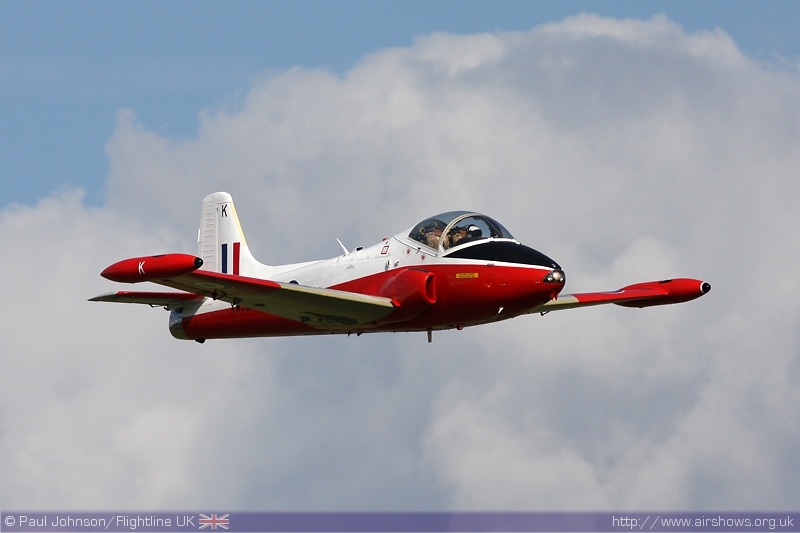 The aircraft returned to the air just in time to make Cosford and the long anticipated start to her 2009 display season in the hands of Martin Withers. 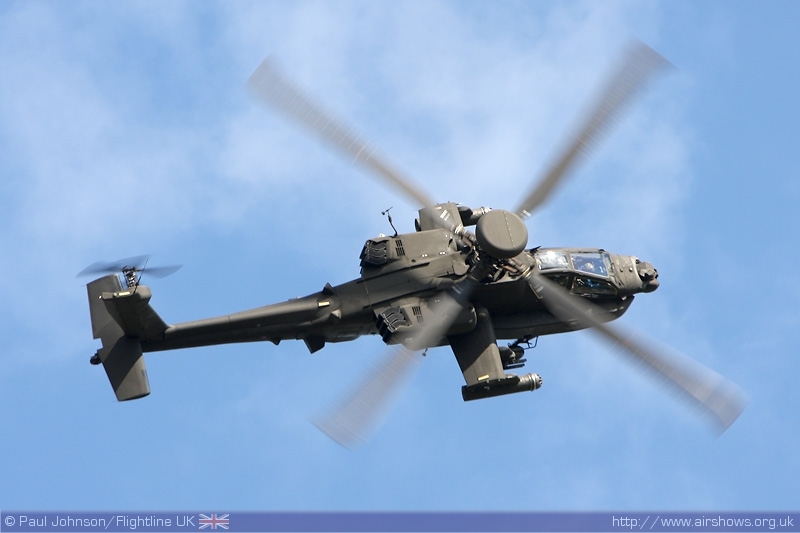 Cosford also attracted all of te UK modern military displays with the full portfolio of RAF teams and solo displays with the Red Arrows, Battle of Britain Memorial Flight, Typhoon, Chinook, Hawk and Tutor in attendance. 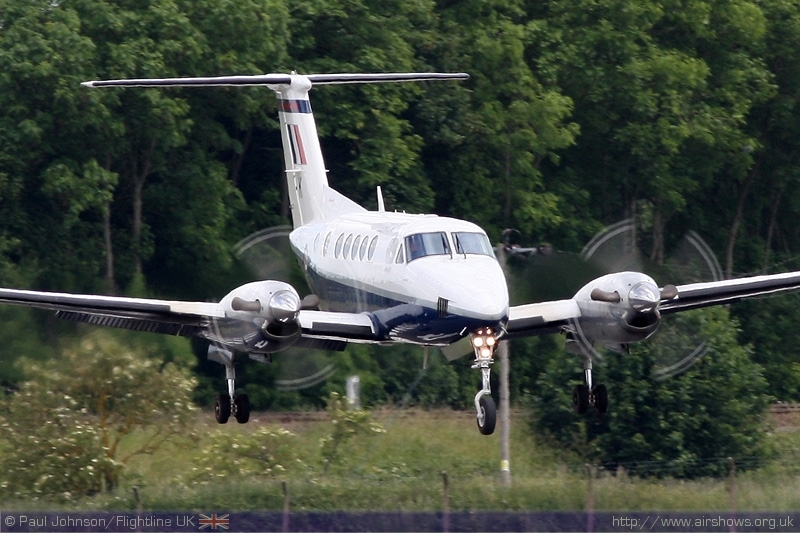 The King Air display team also made their first appearance of the year. Despite starting slightly later than many of the other teams, the King Air is committed to more events throughout the 2009 season building on the success of their debut last year. 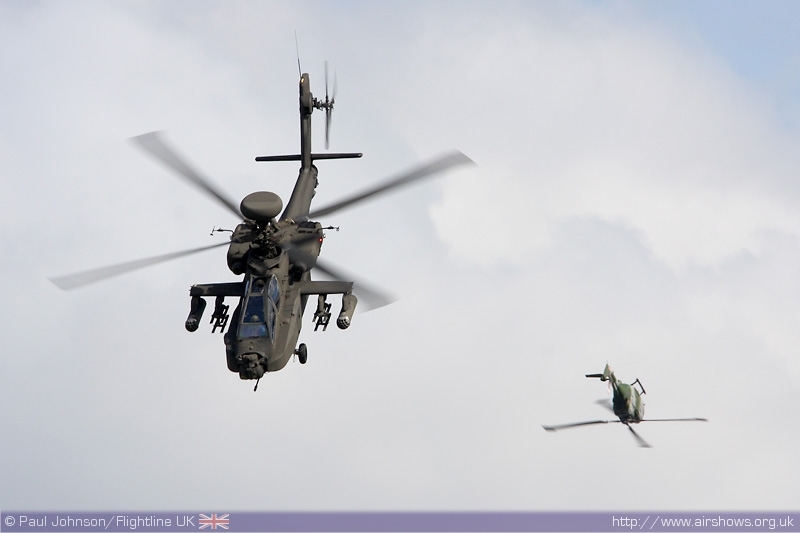 The Royal Navy's solo representation was the Black Cats display team, but they were joined by the Army's new look Blue Eagles display team with their WAH-64D Apache and Lynx AH7 duo which is a very interesting display. 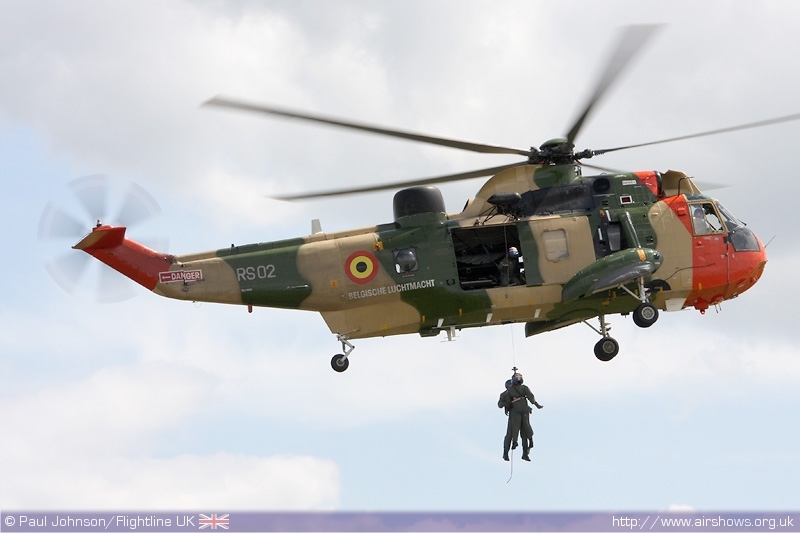 The only international display of the afternoon was from the Belgian Air Component's Sea King Mk48 giving a search and rescue demonstration. 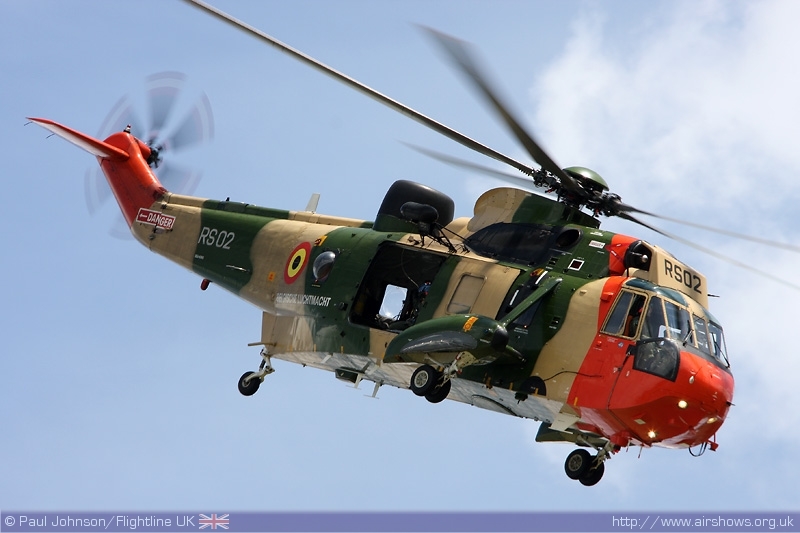 The vividly marked Sea King was one of the highlights of the afternoon. 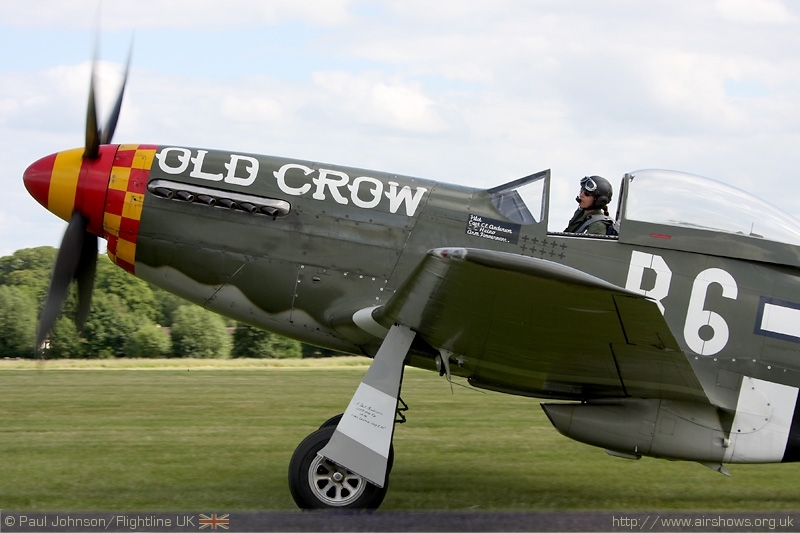 The 2009 Cosford was the perfect family airshow with a great airfield, stunning weather and a good varied line up of aircraft to suit all tastes. The huge crowds that Cosford attacts year on year are testament to that.